What does running the Boston Marathon mean to you? How has CITGO helped your school/district? What does that partnership mean to you as an educator? For Irene Hinojosa, a teacher at Corpus Christi's Moody High School, running the Boston Marathon is a dream come true. "I really want my students to learn from this experience, if they always work hard and preserve they can accomplish whatever they want," said Hinojosa. "This gives them a chance to see that for themselves." 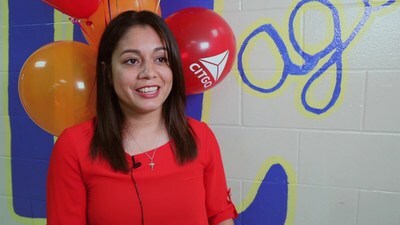 "Education is one of the pillars in our corporate social responsibility program, and we know how hard our teachers work for our local communities," said Larry Elizondo, CITGO General Manager Community Relations, CSR and Legislative Affairs. "That's why we wanted to reward them with an opportunity to showcase their commitment, perseverance and skill. The Boston Marathon is one of the elite athletic events of the year and we are proud to support these incredible individuals as they pursue this accomplishment." Continuing a tradition started in 2017, CITGO will host a "cheer zone" located one mile from the finish beneath the CITGO sign in Kenmore Square, where company representatives and supporters will gather to encourage our teachers and other participants as they take their final steps toward the Boylston Street finish line. "With our sign in Kenmore Square, CITGO is always present for the marathon," continued Elizondo. "And serving as the Official Fuel Sponsor is just another way for us to champion this great American tradition by directly supporting and recognizing all the athletes and educators who put in the time, sweat and effort to finish the 26.2 mile race." CITGO has been part of the Boston community since 1940, when Cities Service opened its divisional headquarters in Boston. In 1965, Cities Service introduced its CITGO brand, replacing the white and green Cities Service logo atop its offices on 660 Beacon Street with the now-iconic CITGO sign in Kenmore Square.